Accept how much the child will be asked to bend. Bend in equal measure. Travel in a mode the child can manage. If waiting in line for more than 15 minutes is a problem, drive. If sitting still for more than 30 minutes is a problem, take the train. With modern security protocols, there are very few accommodations to be had at airports. Fly only if the child is nearing the skill set required. Electronics, electronics, electronics. Charge ’em up. Plug ’em in. Better to deal with tantrums at the destination rather than in the air, on the road, or along the tracks. Fidget items, both favorites and new, help when electronics can’t be used. Save for moments that call for happy surprise and distraction. Pack snacks. Loads of ’em. Especially chewy ones for air travel. 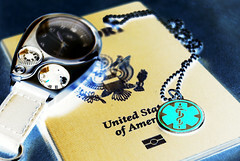 Medic alert tags (necklace, bracelet, shoe tag, or whatever will stay on) serve three purposes: to reunite the family if the child wanders, to alert security that there may be a reason for disruptive behaviors, and to give parental peace of mind that there is a safety net in both scenarios. Plan some parental pampering the night before and the day after travel. Then take a deep breath and survive the ride. Plan, try, do. Then ignore any looks and comments. Remember: all of us learn by doing. Without doing and failing a little, we’ll never get enough practice to do and succeed. Just do it. We have traveled cross-country, one way or another, each year since our son was diagnosed. Recent highlights are available on this blog. Hi do you use a communication passport? my daughter is non-verbal and was diagnosed with autism at 18 months. we often use virtual tours (the internet has been so useful a god send really). Ella has taught us to relax but the price is sometimes walking away from whatever we had planned. A thing we have always done is build in spontaneous activity and deliberate breaking of routines which has resulted in Ella having very few defragmentation episodes now. When my son was younger, I would make home-made icons that velcroed onto communication boards. We were very lucky, though, that he started verbally communicating at 4 years old. Now we almost can’t get him to stop talking;-) We work with him to make lists now, just on regular paper. And I agree about the internet. We use it to prepare him for what we’re going to see, even letting him help decide part of the itinerary now. But we have had our share of meltdowns and changes of plans along the way. We have to pick our sights to see and our pace very carefully. An amazing post — helpful for traveling with any child, actually.